The upsurge of technological advancements is possibly best received in the medical field, as is justified with the growth of surgical staplers market, a key vertical of the healthcare space. Indeed, this business sphere has been an outcome of medical practitioners fast adopting to a modern approach to closing surgical wounds. Using surgical staplers guarantee a much faster wound closure procedure and is much preferred by surgeons as staples cause less negative side effects and involve minimal skin penetration. 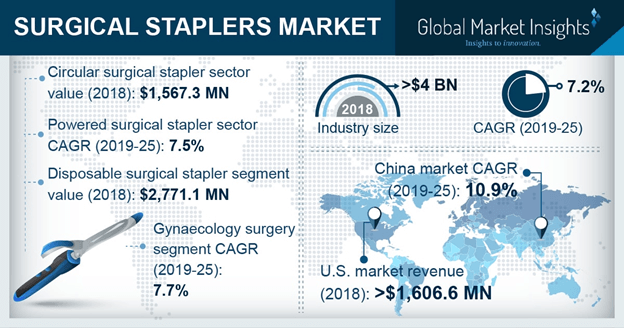 Considering that more than 230 million of surgical procedures such as gynecological, abdominal, pediatric and thoracic surgeries take place around the world every day, where surgical stapling has come to be a norm, global surgical staplers is expected to register a remarkable CAGR over 2018-2024. In 2007 a California-based publisher of medical technology market, analyzed the European wound closure market and reported that the proportion surgical staplers was more than 40% of the total wound closure market volume in the continent. Since then surgical staplers industry has only served to advance further. For instance, recently Intuitive Surgical, an American corporation that develops and markets robotic products for improved clinical outcomes, received approval from the U.S. Food and Drug Association for its SureFrom 60, a 60 mm single-patient-use stapler that is being touted as a first in the surgical staplers industry with a 120 degrees fully-wristed articulation. The SureForm 60 device can be readily used for general, gynecologic, pediatric and urologic wound closures and is also built to be compatible with the daVinci console, the robotic surgical system also developed by Intuitive Surgical. One sector where surgical stapling has found major application is in bariatric surgery. Bariatric or stomach stapling surgery is a method performed on people with acute obesity and achieves its purpose of weight loss by reducing the patient’s stomach size and eventually decreasing the patient’s appetite. According to the World Health Organization, obesity has tripled since 1975. In 2016 nearly 1.9 billion adults were estimated to be overweight of whom 650 million were obese. This brings the percentage of obesity across the globe to nearly 13%. Obesity can lead to various health risks which include cardiovascular diseases, diabetes, high blood pressure, musculoskeletal disorder and even some forms of cancer. Technological innovation is adding advantages and growth to the surgical staples market. Many medical practitioners, with a view of improving the surgical experience of patients are using absorbable skin staples to close surgery incisions. These staples, which are placed underneath the skin, are considered to be of superior cosmetic quality. Clinical studies have made it evident that use of absorbable staples result in lower wound complications and surgical site infection when compared to use of metal skin staples or suture. Unlike metal staples which have to be removed post-operatively, absorbable staples dissolve by themselves rendering them more comfortable during recovery. Driven by a plethora of innovations and the incredible efforts put in by medical device companies leading to a highly ferocious competitive outlook, surgical staplers industry expected to gain extensive traction in the ensuing years. As per estimates, global surgical staplers market size is expected to cross USD 6 billion by 2024.